This tour starts at 8.00am. You are picked up from your hotel by your guide. Drive south of Chiang Mai for approx. 1 hr to the town of Chomtong. Close to this town we turn off the road into the Doi Inthanon National Park. Then drive up to the top of Doi Inthanon (another 50kms approx.) - at the top you can see the twin chedis commemorating the birthdays of the King and Queen of Thailand, as well as take a walk to see the unique flora of the area. Because of the high altitude the flora is noticeably different from that at lower altitudes. It is also the only place where you will see rhododendrons growing in Thailand. On the way down from the summit stop to see the Mae Klang waterfall and a Karen hilltribe village. Also explore the local agricultural research station which grows and experiments with crops that can be grown in the area. Drive back to Chiang Mai, (approx 1½hrs.). This tour ends when you are taken back to your hotel at approx. 4pm. Notes: This is a private tour; entrance fees and lunch are included. 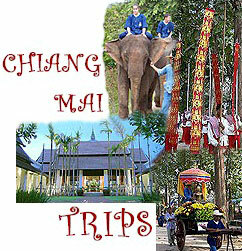 This tour is a private trip to the Doi Inthanon National Park, Thailand's highest mountain and the surrounding area. 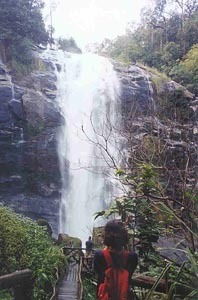 Views, waterfalls and hilltribes. The trip departs 0830 ;lunch & entrance fees are included. Pick up and drop off at your hotel. If there are any further details (or need help in booking a hotel) please write in the box. Copyright © 1998-2012 Wayfarers Travel All rights reserved.